Anyone who’s seen me present at any event has heard me ask everyone in the audience to find something about our technology that they love and share that knowledge by putting together a presentation. I wrote a blog post about it on the old SQLBlog.com site, in my post titled Developing New Speakers. Prior to my getting involved in the SQL Server community, I was involved in running via my running club Cleveland West Running Club and directing a 5K race here in Brunswick to benefit kids in our local school district. I also served on the Strategic Planning team to help the district and the community better align with each other, which led to my serving twelve years on the board of the Brunswick Education Foundation. When I stepped down from that post, my wife took my seat and serves as its President now. Community has always important to me, as you you may gather. After attending my first PASS Summit in 2003, I learned about a local SQL Server user group that had formed, and I started attending meetings. As I was able to frequently answer people’s questions (due to the great education I was getting via the PASS Summit), the leaders deferred to me more frequently, to the point where I was leading the group. I led the group until a little over 3 years ago, when I passed it on to younger hands. Now, for the last two and a half years, I’ve been serving on the board of PASS, the organization from which I have gained so much. I’ve gotten jobs, and now have my own company, DataPerf Professionals, as a result of the relationships and knowledge I’ve gained through PASS. It’s true that the more you give, the more you get in return. My life is significantly better because of my community involvement. I’m still involved in the running community, and will be running my next half marathon on May 26. I’ll be on the PASS Board of Directors until the end of this year, working to try and and help provide the best learning opportunities for the SQL community around the world. I’ve also joined an amazing volunteer organization, the Cleveland Orchestra Chorus, and traveled with them to New York City last January to perform Haydn’s “The Seasons” at Carnegie Hall last January. Just as I ask my audience to share their knowledge with others, I’ll ask you to share your time with others. It’s been incredibly rewarding for me, and I think you’ll find the same to be true for yourselves. 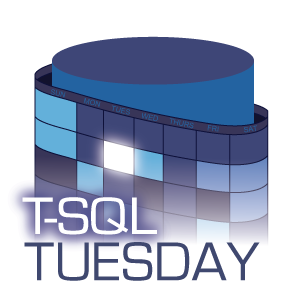 Thanks to Riley Major (b|t) for this great T-SQL Tuesday topic!